"This historic winery is known for producing some of the most traditionally-crafted, age-worthy wines in the appellation. To illustrate this, they have also kept back an extensive library of older vintages. These wines can last at least 40 years, as is illustrated if you get a chance to try the first vintage of the Chianti Classico Riserva – the 1971. The 298 hectare estate (with a modest 54 hectares of vineyards) sits atop a hill in Castelnuovo Berardenga. Most of its vineyards are on the south facing sides of the hill – with olive groves and forest interspersed throughout. Proprietress Principessa Coralia Pignatelli della Leonessa and her husband first saw the estate in 1967 and then bought the property in 1968. At that time, there was just the 13th century farmhouse and outbuildings along with one hectare of vineyards. They quickly set out to expand their plantings and to update the farmhouses. In doing so, they sought the advice of the Chianti consorzio, quickly eliminating the use of white grapes in their wine and soon thereafter switching to 100% Sangiovese. There are eight different vineyard sites which Coralia feels represent the various terroirs and microclimates that Tuscany has to offer. The soil is mainly alluvial with pebbles and sand, though in Poggio delle Rose, perhaps her top site, there are also concentrations of clay and limestone. The botti-aged Chianti Classico and Chianti Classico Riserva make up the major part of their production. 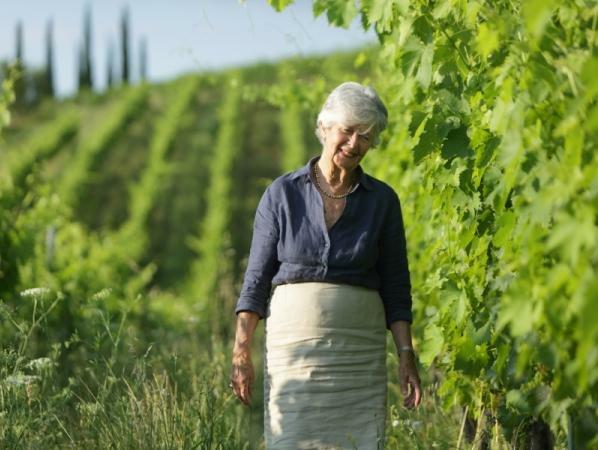 They also make a single-vineyard Chianti Classico Riserva from their Poggio delle Rose vineyard as well as a Sangiovese-Cabernet blend called Santa Croce. The Cabernet was grafted over their old Canaiolo vines in 1983. They also make a very small production Vin Santo that spends a minimum fifteen years in small oak caratelli before bottling. Stylistically, the wines are classic, elegant and traditional. The Chiantis, even the "current" releases, are held back in bottle to give added complexity and refinement. The wines display classic aromas and flavors of dried fruits and flowers, minerals and a dusty/earthy core that is uniquely Tuscan. There is an energy and lift to all the wines with well-integrated acidity and balanced structure. They are a perfect fit and another benchmark Italian property to add to our line-up."